DESCRIPTION: Height up to 50cm. A quintessential British flower that has long glossy green linear leaves arising at the base of the plant from which the flower stalk arises supporting a one-sided raceme. The raceme holds up to 16 drooping bell-shaped flowers which are blue to blue violet in colour (sometimes pink or white forms occur). Each flower has recurved edges and cream anthers. DISTRIBUTION: Widespread and frequent. HABITAT: Woodlands, open grassland and coastal cliffs. FLOWERING TIME: April to June. 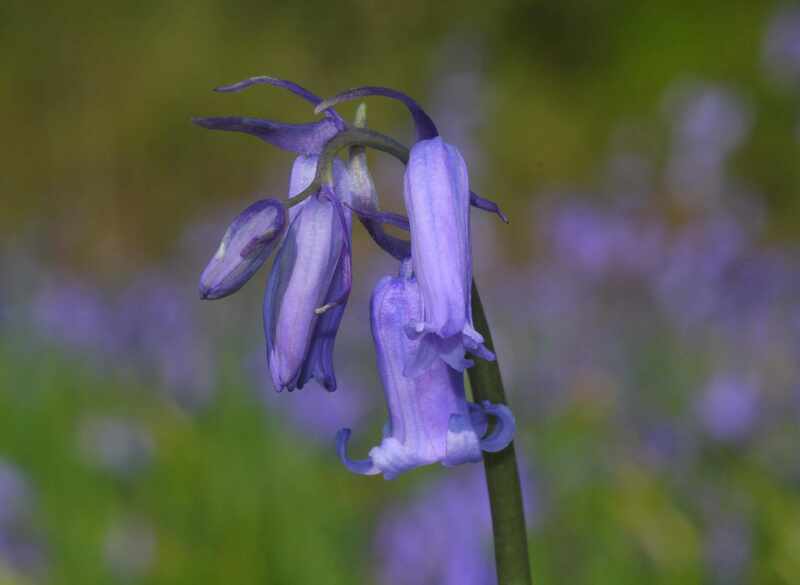 FURTHER INFO: The Bluebell is also known as the Wild Hyacinth, Auld Man's Bell's and Culverkeys. It is the birthday flower for the 30th September and symoblises solitude and regret. The bulk of the plant is diuretic and a styptic but when used fresh it is found to be poisonous.